For the MOS 6502 assembler for Apple II computers, see Lisa assembler. Apple Lisa, with an Apple ProFile external hard disk sitting atop it. Note the dual 5.25-inch "Twiggy" floppy drives. Apple Lisa was a desktop computer developed by Apple, released on January 19, 1983. It was one of the first personal computers to offer a graphical user interface (GUI) in a machine aimed at individual business users. 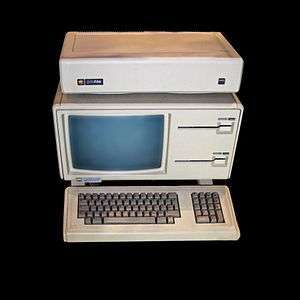 Development of the Lisa began in 1978, and it underwent many changes during the development period before shipping at the very high price of US$9,995 with a 5 MB hard drive. The high price, relatively low performance and unreliable "Twiggy" floppy disks led to poor sales, with only 100,000 units sold. In 1982, after Steve Jobs was forced out of the Lisa project, he joined the Macintosh project, at that time developing a much more limited machine with a task-switching interface. Jobs redirected the Macintosh team to build a cheaper and better Lisa, releasing it in January 1984 and quickly outstripping Lisa sales. Newer versions of the Lisa were introduced that addressed its faults and lowered its price considerably, but it never really picked up sales compared to the much less expensive Mac. The final revision of the Lisa, the Lisa 2/10, was modified and sold as the Macintosh XL. Generally considered a failure, the Lisa nevertheless introduced a number of advanced features that would not re-appear on the Macintosh for a number of years. Among these was an operating system which featured protected memory and preemptive multitasking, and a more document-oriented workflow. The hardware itself was also much more advanced with a hard drive and support for up to 2 megabytes (MB) of RAM, expansion slots and a larger higher-resolution display. The Macintosh featured a faster 68000 processor (7.89 MHz) and sound; however, the complexity of the Lisa operating system and its programs overtaxed the 5 MHz Motorola 68000 microprocessor enough that consumers said it felt sluggish, particularly when scrolling in documents. While the documentation shipped with the original Lisa only ever referred to it as The Lisa, officially, Apple stated the name was an acronym for Local Integrated System Architecture or "LISA". Since Steve Jobs's first daughter (born in 1978) was named Lisa Nicole Brennan, it was normally inferred that the name also had a personal association, and perhaps that the acronym was a backronym invented later to fit the name. Andy Hertzfeld states the acronym was reverse engineered from the name "Lisa" in autumn 1982 by the Apple marketing team, after they had hired a marketing consultancy firm to come up with names to replace "Lisa" and "Macintosh" (at the time considered by Jef Raskin to be merely internal project codenames) and then rejected all of the suggestions. Privately, Hertzfeld and the other software developers used "Lisa: Invented Stupid Acronym", a recursive backronym, while computer industry pundits coined the term "Let's Invent Some Acronym" to fit the Lisa's name. Decades later, Jobs would tell his biographer Walter Isaacson: "Obviously it was named for my daughter." The project began in 1978 as an effort to create a more modern version of the then-conventional design epitomized by the Apple II. Initial team leader Ken Rothmuller was soon replaced by John Couch, under whose direction the project evolved to the "windows & mouse-driven" form that was finally released. Trip Hawkins, who was then on the marketing team for the nascent Lisa project, and Jef Raskin contributed to the change in design. Several years prior to this, research had been going on at Xerox's Palo Alto Research Center to create a new way to organize everything on the screen, today known as the desktop metaphor. Steve Jobs visited Xerox PARC in 1979. He was excited by the revolutionary mouse-driven GUI of the Xerox Alto and was keen to use these ideas back at Apple. By late 1979, Jobs successfully negotiated with Xerox for his Lisa team to receive two demonstrations of ongoing research projects at Xerox PARC; when the Apple team saw the demonstration of the Alto computer they were able to see in action the basic elements of what constituted a workable GUI. A great deal of work was put into making the graphical interface into a mainstream commercial product by the Lisa team. By May 1982 InfoWorld reported that "Apple's yet-to-be-announced Lisa 68000 network work station is also widely rumored to have a mouse." The Lisa was a major project at the company, which reportedly spent more than $50 million on its development. More than 90 people participated on the design, plus more on the sales and marketing effort to launch the machine. BYTE credited Wayne Rosing with being the most important person on the development of the computer's hardware until the machine went into production, at which point he became technical lead for the entire Lisa project. Bruce Daniels was in charge of applications development, and Larry Tesler was in charge of system software. After a six-month period in which the user interface was designed, the hardware, operating system, and applications were all created in parallel. The hardware development team for the Lisa was headed by Robert Paratore. The Lisa was first introduced on January 19, 1983 and cost US$9,995 (approximately US$23,800 in 2015 dollars.) It was one of the first personal computer systems with a graphical user interface (GUI) to be sold commercially. It used a Motorola 68000 CPU clocked at 5 MHz and had 1 MB RAM. The industrial design, product design and mechanical packaging and enclosure/structural design and development were headed by Bill Dresselhaus, the Principal Product Designer of Lisa, with his team of internal product designers and contract product designers from the firm that eventually became IDEO. The Lisa computer real-time clock uses a 4-bit integer and the base year is defined as 1980, and the software won't accept any value below 1981 so the only valid range is 1981-1995. Thus it has a "1995 problem". The real-time clock depended on a 4 x AA-cell NiCd pack of batteries that only lasted for a few hours when main power was not present, often causing the packs to burst open and leak corrosive acid that could ruin the circuit boards. The original Lisa, or Lisa 1, had two Apple FileWare 5.25-inch double-sided floppy disk drives, more commonly known by Apple's internal code name for the drive, "Twiggy". They had a capacity of approximately 871 kB each, but proved unreliable and required special diskettes. 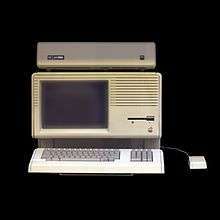 The Macintosh, which was intended to implement a single Twiggy drive partway through development, was revised to use a Sony 400 kB microfloppy drive. An optional external 5 MB or, later, a 10 MB Apple ProFile hard drive (originally designed for the Apple III) was available. With the introduction of the Lisa 2/10, an optional 10 MB internal proprietary hard disk manufactured by Apple, known as the "Widget", was also offered. The first hardware revision, the Lisa 2, was released in January 1984 and was priced between $3,495 and $5,495 US. It was much less expensive than the original model and dropped the Twiggy floppy drives in favor of a single 400k Sony microfloppy. It was possible to purchase the Lisa 2 with as little as 512k RAM. The Lisa 2/5 consisted of a Lisa 2 bundled with an external 5MB or 10MB hard drive. In 1984, at the same time the Macintosh was officially announced, Apple offered free upgrades to the Lisa 2/5 to all Lisa 1 owners, by swapping the pair of Twiggy drives for a single 3.5-inch drive, and updating the boot ROM and I/O ROM. In addition, the Lisa 2's new front faceplate was included to accommodate the reconfigured floppy disk drive. With this change, the Lisa 2 had the notable distinction of introducing the new Apple inlaid logo, as well as the first Snow White design language features. The Lisa 2/10 featured a 10MB internal hard drive (but no external parallel port) and a standard configuration of 1MB of RAM. Developing early Macintosh software required a Lisa 2. There were relatively few third-party hardware offerings for the Lisa, as compared to the earlier Apple II. AST offered a 1.5 MB memory board, which – when combined with the standard Apple 512 KB memory board – expanded the Lisa to a total of 2 MB of memory, the maximum the MMU could address. Late in the product life of the Lisa, there were third-party hard disk drives, SCSI controllers, and double-sided 3½ inch floppy-disk upgrades. Unlike the original Macintosh, the Lisa features expansion slots. Like the Apple II, it was an "open system". The Lisa 2 motherboard had a very basic backplane with virtually no electronic components, but plenty of edge connector sockets/slots. There were two RAM slots, one CPU slot and one I/O slot all in parallel placement to each other. At the other end, there were three "Lisa" slots, parallel to each other. This flexibility provided the potential for a developer to create a replacement for the CPU "card" to upgrade the Lisa to run a newer CPU, albeit with potential limitations from other parts of the system. In January 1985, following on the heels of the Macintosh, the Lisa 2/10 (with integrated 10 MB hard drive) was re-branded the Macintosh XL and with new software, positioned as Apple's high-end Macintosh. The price was lowered yet again, to $4000 and sales tripled, but (according to CEO Sculley) Apple would have lost money increasing production to meet the new demand. Apple discontinued the Macintosh XL, leaving an eight-month void in Apple's high-end product line until the Macintosh Plus was introduced in 1986. The Lisa operating system featured preemptive multitasking and protected memory, then extremely advanced features for a personal computer. Based in part on advanced elements from the failed Apple III SOS operating system released three years earlier, the Lisa also organized its files in hierarchal directories, making the use of large hard drives practical. The Macintosh would eventually adopt this disk organizational design as well for its HFS filing system. Conceptually, the Lisa resembles the Xerox Star in the sense that it was envisioned as an office computing system; consequently, Lisa has two main user modes: the Lisa Office System and the Workshop. 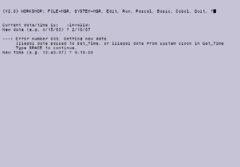 The Lisa Office System is the GUI environment for end users. The Workshop was a program development environment, and was almost entirely text-based, though it used a GUI text editor. The Lisa Office System was eventually renamed "7/7", in reference to the seven supplied application programs: LisaWrite, LisaCalc, LisaDraw, LisaGraph, LisaProject, LisaList, and LisaTerminal. The operating system – not the applications – was not capable of supporting the demands of advanced users and was prone to crash then restart under heavy load from large, complex spreadsheets or graphs produced from them. To its credit, Apple's warranty said that this software worked precisely as stated, and Apple refunded an unspecified number of users in full for their systems, both of which were unprecedented in the computing business. A significant impediment to third-party software on the Lisa was the fact that, when first launched, the Lisa Office System could not be used to write programs for itself: a separate development OS, called Lisa Workshop, was required. During this development process, engineers would alternate between the two OSes at startup, writing and compiling code on one OS and testing it on the other. Later, the same Lisa Workshop was used to develop software for the Macintosh. After a few years, a Macintosh-native development system was developed. For most of its lifetime, the Lisa never went beyond the original seven applications that Apple had deemed enough to "do everything", although UniPress Software did offer Unix for $495. 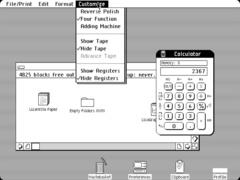 In April 1984, following the release of the Macintosh, Apple introduced MacWorks, a software emulation environment which allowed the Lisa to run Macintosh System software and applications. MacWorks helped make the Lisa more attractive to potential customers, but did not enable the Macintosh emulation to access the hard disk until September. In January 1985, re-branded MacWorks XL, it became the primary system application designed to turn the Lisa into the Macintosh XL. BYTE wrote in February 1983 after previewing the Lisa that it was "the most important development in computers in the last five years, easily outpacing [the IBM PC]". It acknowledged that the $9,995 price was high, and concluded "Apple ... is not unaware that most people would be incredibly interested in a similar but less expensive machine. We'll see what happens". The Apple Lisa was a commercial failure for Apple, the largest since the failure of the Apple III of 1980. The intended business customers were reluctant to purchase the machine because of its high launch price of US$9,995 (equivalent to nearly US$23,800 in 2015), making it largely unable to compete with the less expensive IBM PCs, which were already beginning to dominate business desktop computing, as well as Steve Jobs's announcement that they'd be releasing a superior system in the future which would not be compatible with it. The largest Lisa customer was NASA, which used LisaProject for project management and was eventually faced with significant problems when the Lisa was discontinued. The release of the Apple Macintosh in 1984, which was faster and much less expensive, was the most significant factor in the Lisa's demise. Two later Lisa models were released (the Lisa 2 and its Mac ROM-enabled sibling Macintosh XL) before the Lisa line was discontinued in April 1985. 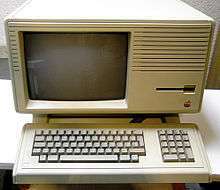 In 1986, Apple offered all Lisa/XL owners the opportunity to return their computer and US$1,498.00, in return for a Macintosh Plus and Hard Disk 20. The Apple Lisa was immediately recognized as a significant machine, with BYTE opining it more important than the IBM PC. Further, though a limited number of Lisas were sold, the Lisa software, in combination with an Apple dot-matrix printer, could produce documents that surpassed other comparably priced options available at the time. This one compelling usage meant that the Lisa was introduced into a number of larger offices, and due to the price, the number of people who had used a Lisa was much larger than the number of Lisas sold. An often-overlooked feature the Lisa system used is its early approach of document-centric computing instead of application-centric computing. On a Macintosh, Windows, or Linux system, a user typically seeks a program. In the Lisa system, users use stationery to begin using an application. Apple implemented stationery documents on System 7 in 1991 and attempted to further advance this approach on the Mac platform later with OpenDoc. Microsoft also later implemented stationery in a limited fashion via the Windows Start menu for Microsoft Office. Within a few months of the Lisa's introduction in the US, fully translated versions of the software and documentation were commercially available for British, French, West German, Italian, and Spanish markets, followed by several Scandinavian versions shortly thereafter. The user interface for the OS, all seven applications, LisaGuide, and the Lisa diagnostics (in ROM) can be fully translated, without any programming required, using resource files and a translation kit. The keyboard can identify its native language layout, and the entire user experience will be in that language, including any hardware diagnostic messages. Although several non-English keyboard layouts were available, the Dvorak keyboard layout was never ported to the Lisa, though such porting had been available for the Apple III, IIe, and IIc, and later for the Macintosh. Keyboard-mapping on the Lisa was complex and required building a new OS/kernel. All kernels contain images for all layouts, so due to serious memory constraints, keyboard layouts were stored as differences from a set of standard layouts, thus only a few bytes are needed to accommodate most additional layouts. A notable exception is the Dvorak layout that moves just about every key and thus requires hundreds of extra bytes of precious kernel storage regardless of whether it was needed. Each localized version (built on a globalized core) requires grammatical, linguistic, and cultural adaptations throughout the user interface, including formats for dates, numbers, times, currencies, sorting, even for word and phrase order in alerts and dialog boxes. A kit was provided, and the translation work was done by native-speaking Apple marketing staff in each country. This localization effort resulted in about as many Lisa unit sales outside the US as inside the US over the product's lifespan, while setting new standards for future localized software products, and for global project co-ordination. The high cost and the delays in its release date contributed to the Lisa's demise although Lisa was repackaged and sold at $4,995, as the Lisa 2. When Apple released the Macintosh a year after Lisa, it swayed consumers away with its lower price tag and relative ease of use. In 1986, the Lisa was discontinued. In 1987, Sun Remarketing purchased about 5,000 Macintosh XLs and upgraded them. Some leftover Lisa computers and spare parts were available until recently when Cherokee Data (who purchased Sun Remarketing) went out of business. In 1989, with the help of Sun Remarketing, Apple disposed of approximately 2,700 unsold Lisas in a guarded landfill in Logan, Utah, in order to receive a tax write-off on the unsold inventory. Like other early GUI computers, working Lisas are now fairly valuable collector's items for which people will pay hundreds or even thousands of dollars. The original model is the most wanted one, but ProFile and Widget hard disks, which are necessary for running the Lisa OS, are almost as valued if in working order. ↑ Simon, Jeffrey S. Young, William L. (April 14, 2006). iCon : Steve Jobs, the greatest second act in the history of business (Newly updated. ed.). Hoboken, NJ: Wiley (retrieved via Google Books). ISBN 978-0471787846. Retrieved January 6, 2014. 1 2 Linzmayer, Owen W. (2004). Apple confidential 2.0 : the definitive history of the world's most colorful company (2nd ed.). San Francisco, Calif.: No Starch Press (retrieved via Google Books). p. 79. ISBN 978-1593270100. Retrieved January 6, 2014. ↑ Lisa Operating System Reference Manual. p. 34. ↑ O'Grady, Jason D. (2009). Apple Inc. Westport, Conn.: Greenwood Press (retrieved via Google Books). p. 7. ISBN 978-0313362446. Retrieved January 6, 2014. ↑ Andy Hertzfeld (2005). "Bicycle". Revolution in the Valley. O'Reilly. p. 36. ISBN 0-596-00719-1. ↑ Isaacson, Walter (2011). Steve Jobs. Simon & Schuster. p. 93. ISBN 978-1-4516-4853-9. ↑ Markoff, John (May 10, 1982). "Computer mice are scurrying out of R&D labs". InfoWorld. pp. 10–11. Retrieved August 26, 2015. 1 2 "The little-known Apple Lisa: Five quirks and oddities". January 30, 2013. Retrieved April 7, 2016. ↑ Linzmayer, Owen W. (2004). Apple confidential 2.0 : the definitive history of the world's most colorful company (2nd ed.). San Francisco, Calif.: No Starch Press (retrieved via Google Books). pp. 77–78. ISBN 978-1593270100. ↑ Linzmayer, Owen W. (2004). Apple confidential 2.0 : the definitive history of the world's most colorful company (2nd ed.). San Francisco, Calif.: No Starch Press (retrieved via Google Books). p. 78. ISBN 978-1593270100. Retrieved January 6, 2014. ↑ Mace, Scott (February 13, 1984). "Apple introduces Lisa 2; basic model to cost $3,500". InfoWorld. 6 (7): 65. Retrieved January 6, 2014. 1 2 Pina, Larry (1990). Macintosh Repair & Upgrade Secrets (1st ed.). Carmel, IN, USA: Hayden Books. p. 236. ISBN 0672484528. ↑ Mace, Scott (February 13, 1984). "Apple introduces Lisa 2; basic model to cost $3,500". InfoWorld. 6 (7): 66. Retrieved January 6, 2014. ↑ da Cruz, Frank (June 11, 1984). "Macintosh Kermit No-Progress Report". Info-Kermit mailing list (Mailing list). Kermit Project, Columbia University. Retrieved February 24, 2016. ↑ "Apple's LISA meets a bad end". InfoWorld. 7 (22): 21. June 3, 1985. ISSN 0199-6649. ↑ Lisa Operating System Reference Manual. p. 50. ↑ "The Lisa 2: Apple's ablest computer". BYTE (12/1984): A106–A114. ↑ "A Look Back At Apple Products Of Old". Technologeek. August 19, 2013. Archived from the original on November 5, 2013. Retrieved September 8, 2015. ↑ "Back In Time", A+ Magazine, Feb 1987: 48–49. ↑ McCollum, Charles (October 16, 2011). "Editor's Corner: Logan has interesting link to Apple computer history". The Herald Journal. Retrieved February 24, 2014. Wikimedia Commons has media related to Apple Lisa.